Allowing government to arbitrarily determine which substances human beings can put into their own bodies is one of the most idiotic things a society can do. As such, its no surprise Congress is salivating at the prospect of furthering this travesty by giving additional discretion on the matter to drug war-crazed loon, Attorney General Jeff Sessions. Reason published an excellent article on the topic in yesterday’s piece: Congress Wants To Give Jeff Sessions Unprecedented New Drug War Powers. The Stop the Importation and Trafficking of Synthetic Analogs Act, or SITSA, is intended to crack down on drugs that closely resemble currently banned or regulated substances in either their chemical structure or intended effects. SITSA would also empower the attorney general (A.G.) to add drugs to this new schedule with few checks from other branches of government…. 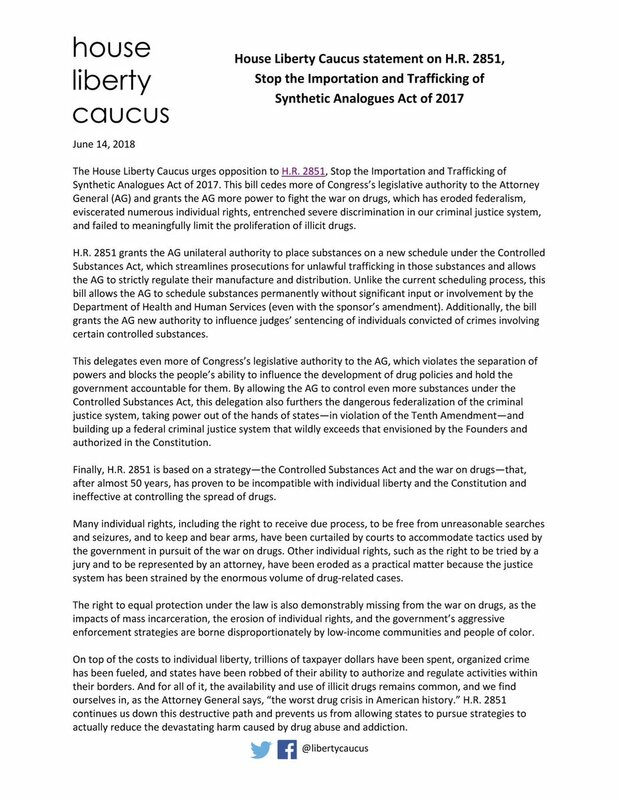 While Department of Justice (DOJ) complaints about analogs aren’t new, the rise of fentanyl analogs have inspired Congress to act more aggressively and clumsily than usual. The Senate version of SITSA introduced by Feinstein and Grassley gives the attorney general unilateral and unchecked power to add a substance to Schedule A. It contains no congressional review provision and vests no authority in the Department of Health and Human Services to challenge the DOJ’s scheduling decision. Fans of the herbal opioid remedy kratom have expressed concerns about SITSA, as have nootropic users and research chemical enthusiasts. The combined vagueness and broadness of this bill should worry all of them. While the immediate justification for the bill is fentanyl, the legislation is so much broader than that. Were coffee and booze not historically entrenched in our culture, this bill would absolutely allow the DOJ to add both caffeine (as a stimulant) and alcohol (as a sedative) to Schedule A of the Controlled Substances Act. Two major points I want to make on this beyond the obvious. First, the failed drug war perfectly demonstrates why most things should be decided at the state/local level. Since Colorado and Washington led the charge in 2012, seven other states (plus D.C.) have legalized recreational cannabis. All the while, Congress has been an absolute zero on the topic, and is now trying to make the situation worse and more arbitrary with this crazy SITSA bill. Second, I’m sure you noticed senior Democrat Dianne Feinstein is a leading sponsor of this nonsense in the Senate. It’s good to know Jeff Sessions is so terrible (and he is) that some Democrats are working tirelessly to empower him in yet another irresponsible way. Drumpf’s crazy. A maniac. Horrible. Hates children. Let’s give him a massively bigger military budget to attack more people who haven’t attacked us. You can’t trust Trump. He’s a Nazi. Let’s give him more massive surveillance powers.